The Govs have had mixed results in their three exhibition matches in Kolarova’s first fall season as head coach, starting with a tough, well-fought 1-1 draw against Western Kentucky. The Govs then went on the road and defeated Mississippi Valley 4-1, before slipping up against West Alabama in the final preseason tune-up by a score of 2-1. Coming into the season, a huge question mark was who would replace the offensive production of Kirstin Robertson. If the exhibition matches were any indication, senior McKenzie Dixon and sophomore Claire Larose look ready for the challenge. Dixon, who scored twice against Mississippi Valley, has shown she can be a proven goalscorer, with both her feet and her head. 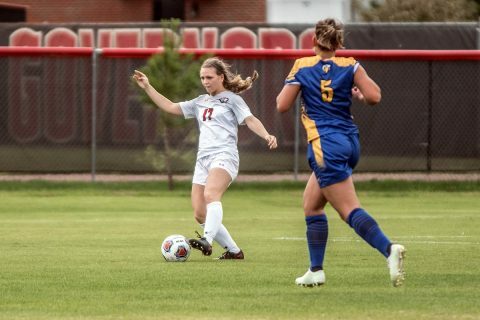 The former first team All-Ohio Valley Conference honoree currently ranks eighth on the all-time list for goals scored in program history and she could be even be higher if not for a couple of injuries. She is also only one of five players in program history to notch a hat-trick. Larose is a pacey, physical attacking player who can take players on and create chances out of seemingly nothing. She routinely got into dangerous positions against Western Kentucky and scored Austin Peay’s first goal against Mississippi Valley. The Canadian played in every game in her debut season last fall for the Govs, ranking second in shots and third in goals scored. The Govs were fortunate enough to retain a lot of key midfield and defensive players, including central midfielder Morgan Drawdy, who was named second team All-OVC and to the All-Newcomer team last fall. Drawdy started all three preseason matches and had an assist on Dixon’s second goal against Mississippi Valley. Across the backline, center back Renee Semaan and goalkeeper Mary Parker Powell have also started every exhibition for the Govs, as the pair look to instill some familiarity between them and the other players who will start in the defense. Middle Tennessee was recently picked eighth out of 14 teams in the Conference USA preseason poll, but boast the C-USA Preseason Offensive Player of the Year in sophomore forward Peyton DePriest. The Blue Raiders have also been busy in preseason, playing two exhibition matches, losing to Northern Kentucky and defeating NAIA member Martin Methodist. The Govs have only beaten the Blue Raiders once in five all-time meetings, but that win came last year in double overtime courtesy of a goal from Dixon off a Semaan cross. Evansville was recently picked seventh out of eight teams in the Missouri Valley, but have beaten the Govs in five out of six all-time meetings. However, like against Middle Tennessee, the Govs won the most recent meeting, a 2-0 victory in 2016. Evansville has played two OVC opponents for its preseason, falling to SIU Edwardsville, but defeating Eastern Illinois.